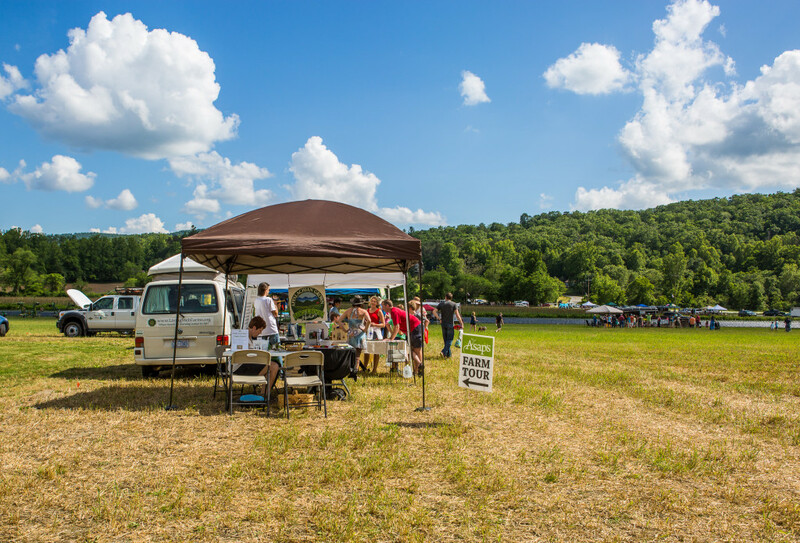 We love to help our community in any way we can, especially when it comes to helping feed the hungry in Western N.C! For the past few years, Jason has worked with Society of St. Andrews (SOSA) and their volunteers. 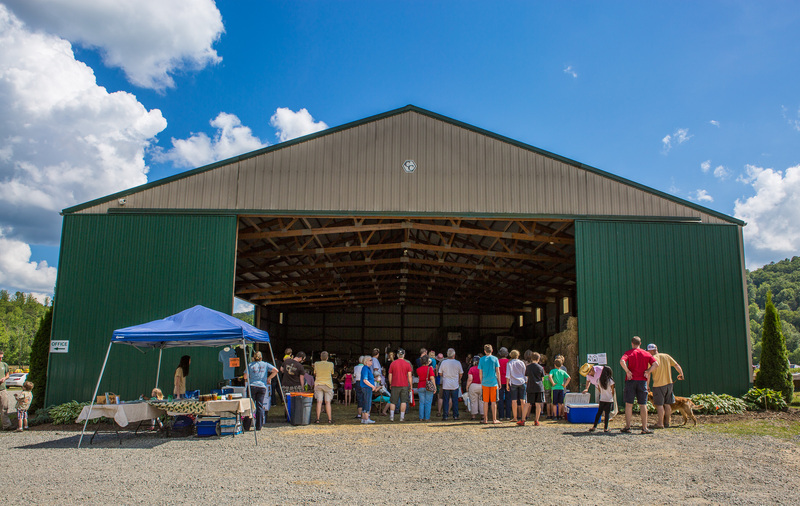 SOSA is such an amazing organization, they travel all over Western NC to farms to help glean farmers fields so they can help feed the hungry with local produce. 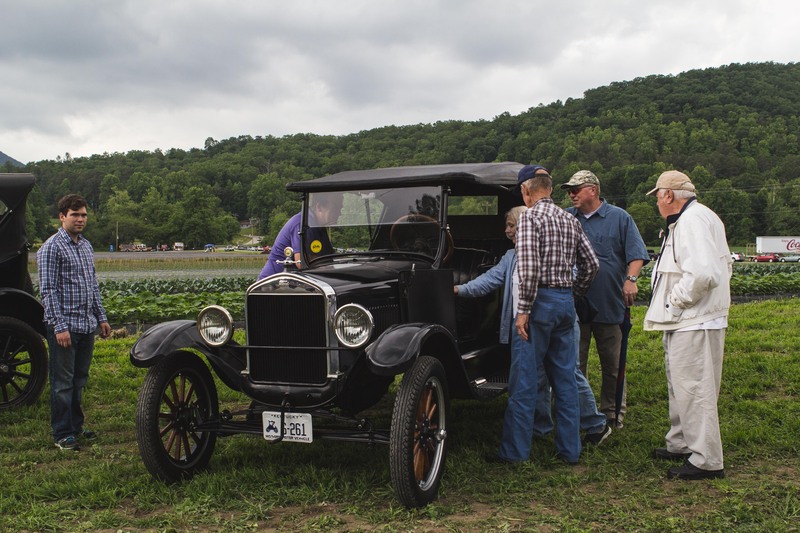 We are so appreciative of their volunteers and the wonderful people who work so hard to schedule, plan and work with farmers busy schedules to pick produce for a great cause. Jason has worked with SOSA for the past few years and it has been nothing but great experiences! 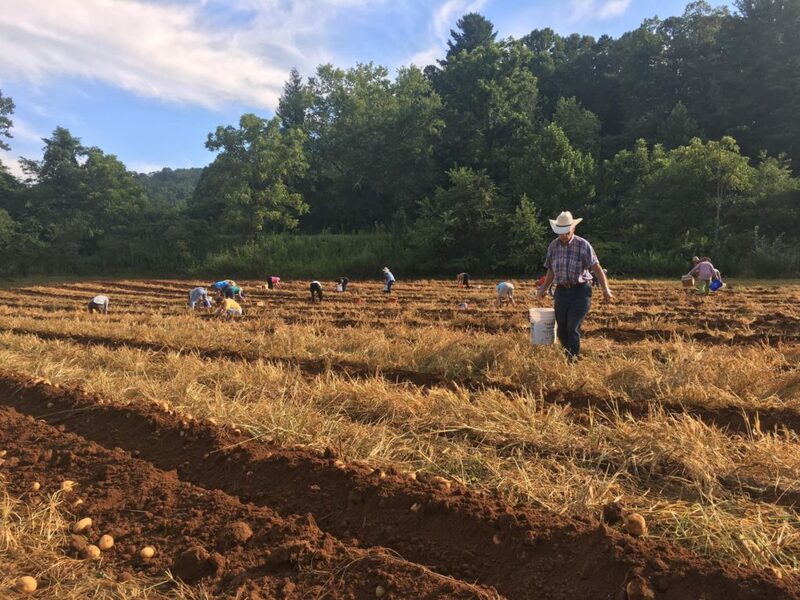 Last year, he and Deidre (works for SOSA) had the awesome idea of planting a plot of potatoes for their mission project that year. That project went so well they decided to make it an annual thing, so this year Jason decided to plant a whole acre of potatoes for them!! SOSA and their volunteers put in so much hard work for this project and we are extremely grateful for them! Deidre and her volunteers come out in mid-March to help prepare seed potatoes so our crew can get them planted in time. 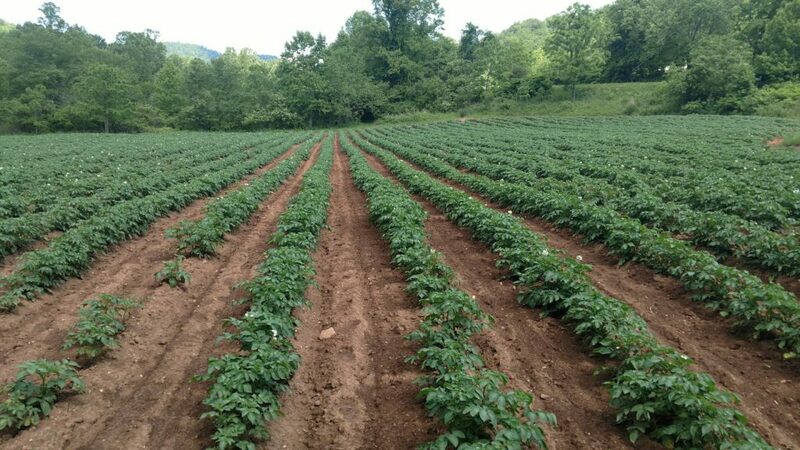 Once the potatoes are ready, Jason and Deidre get their crews ready and they start to harvest as many potatoes they can! And this is no easy task in hot, humid mid-August weather! There were so many potatoes we didn’t get them all picked in one day so they’ll be out again in a week or so once this rain clears up to finish the field off. 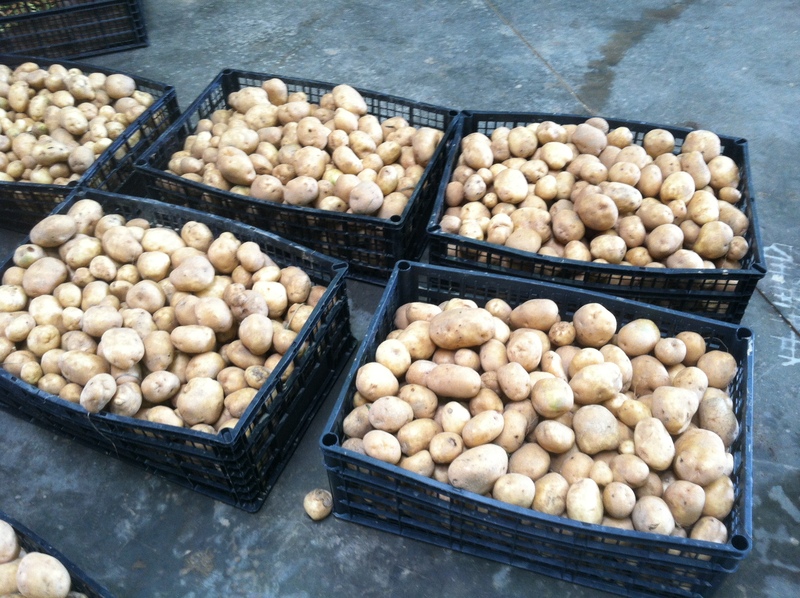 Again a HUGE Thank You to all volunteers because harvesting potatoes or any crop is no easy or fun task!! 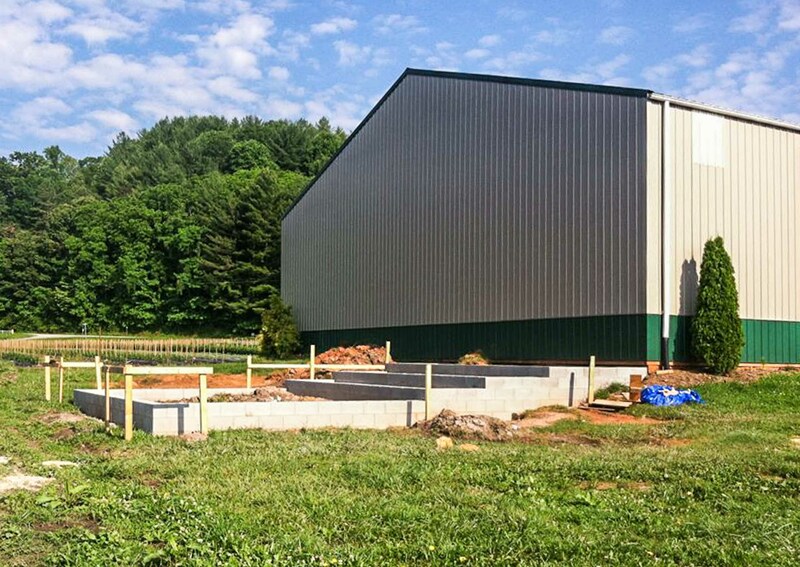 Exciting Things Are Coming To The Farm! 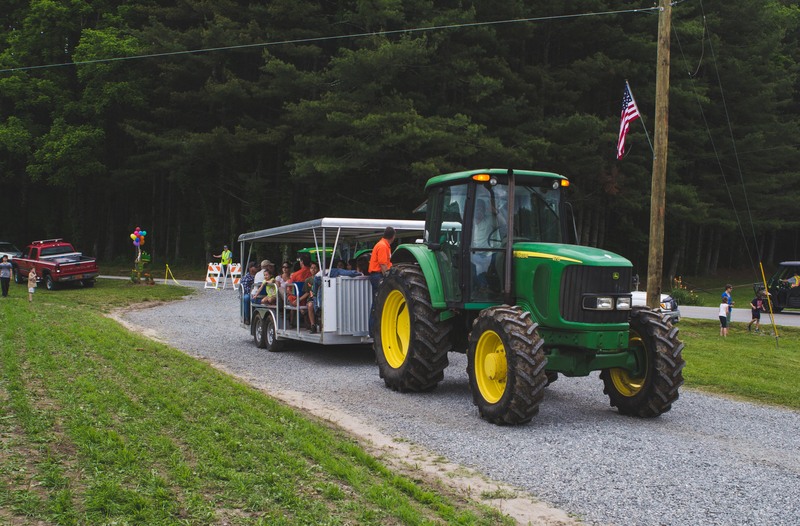 The Agritourism department is also getting busy with planning some awesome farm tours and events this year! 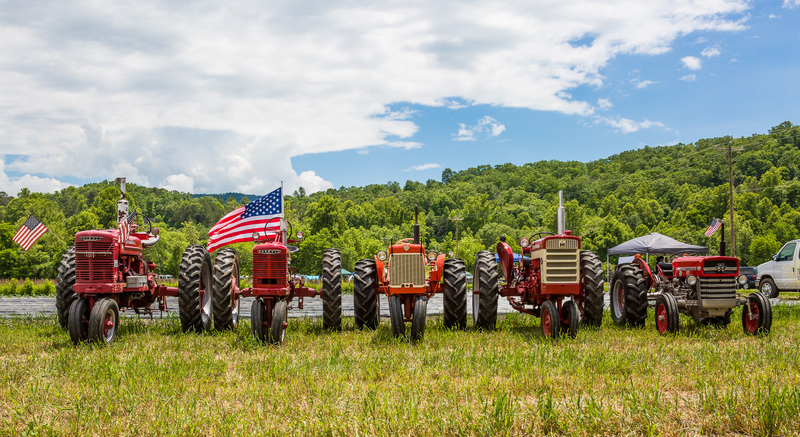 Let us know if you have a group (any age) that is interested in seeing how a true farm runs! 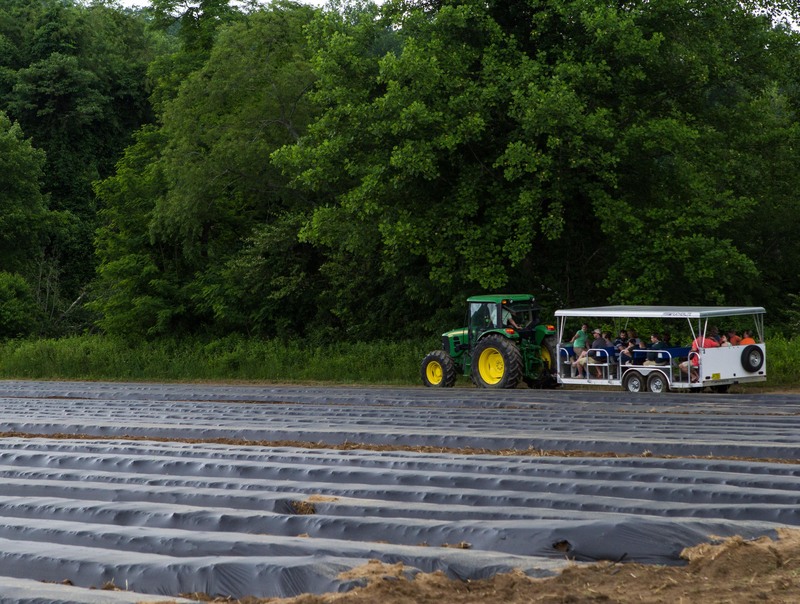 We’ll take you on a hayride around our fields, look at equipment, plant or pick produce (depending on the time of year), and learn about various growing techniques! 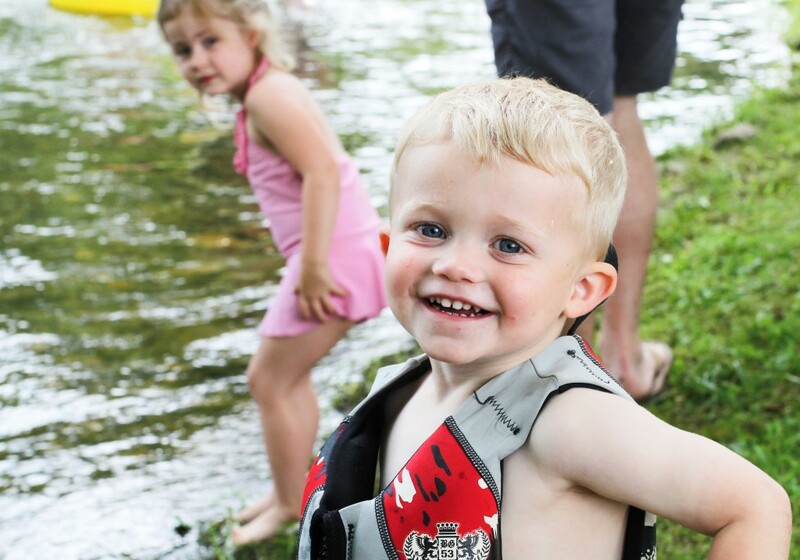 We can even take a dip in the river to cool off if you’d like! 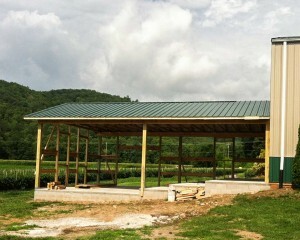 Besides the farm tours, we are opening our barn/property for events this year! We already have a few events in the works but would love to have more! Keep us in mind if you have a birthday (any age), business luncheon, or get togethers–we’d love to have ya’ll!! Make sure to keep up with us on Facebook or check our website for more updated information and pictures of what’s happening around here! 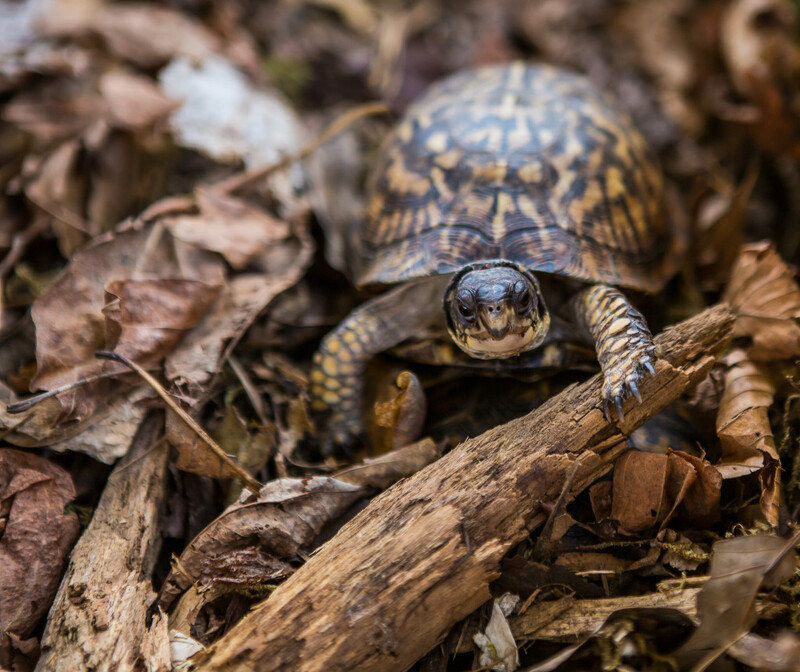 There has been a lot happening here around the farm since our last posts. One big change that we are all excited about is adding some new members to our farm! 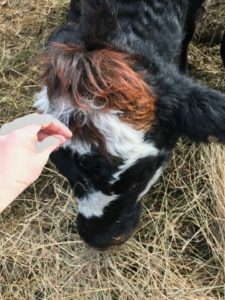 A few months back, we added about 30 beautiful cows to our farm and they have been doing awesome! Our crew has been checking on them daily and keeping them well fed! All are happy and healthy! Hello, everyone! 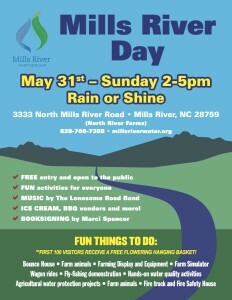 It’s the time of year again for us to be preparing for Mills River Day. Last year, the Mills River Partnership sponsored Mills River Day for the first time. 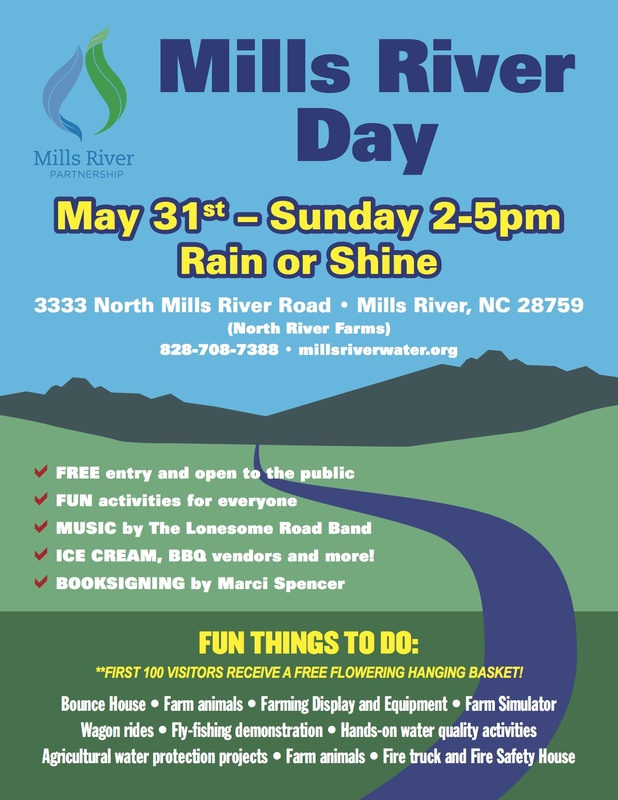 We’re excited that it has become an annual event, with the second Mills River Day taking place on Sunday, May 31st, rain or shine, from 2:00-5:00. 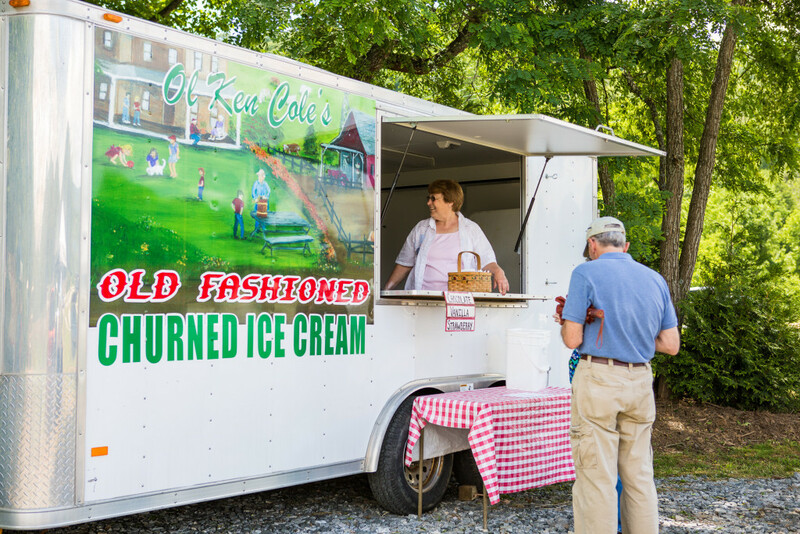 If you came out to Mills River Day last year, you know all about the ice cream, farm animals, equipment display, live music, and wagon rides. 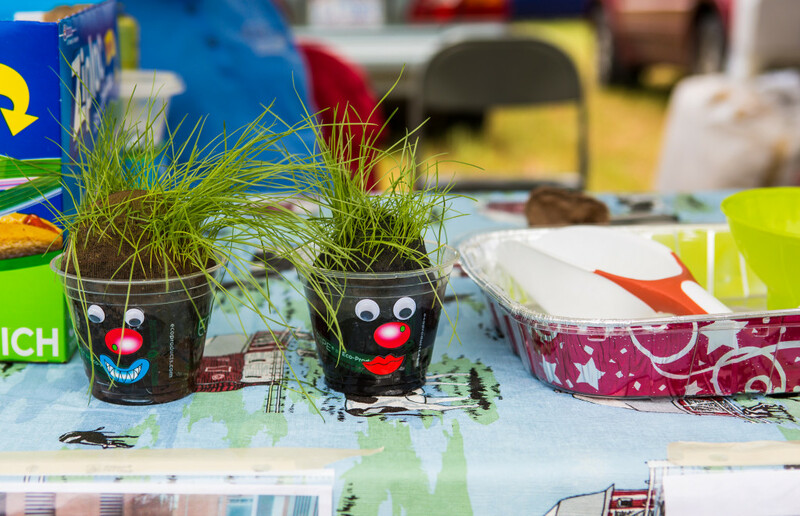 All of those fun activities will be back this year, plus barbecue, a book signing, fly-fishing demonstrations, a farm simulator, a fire safety house, and more. 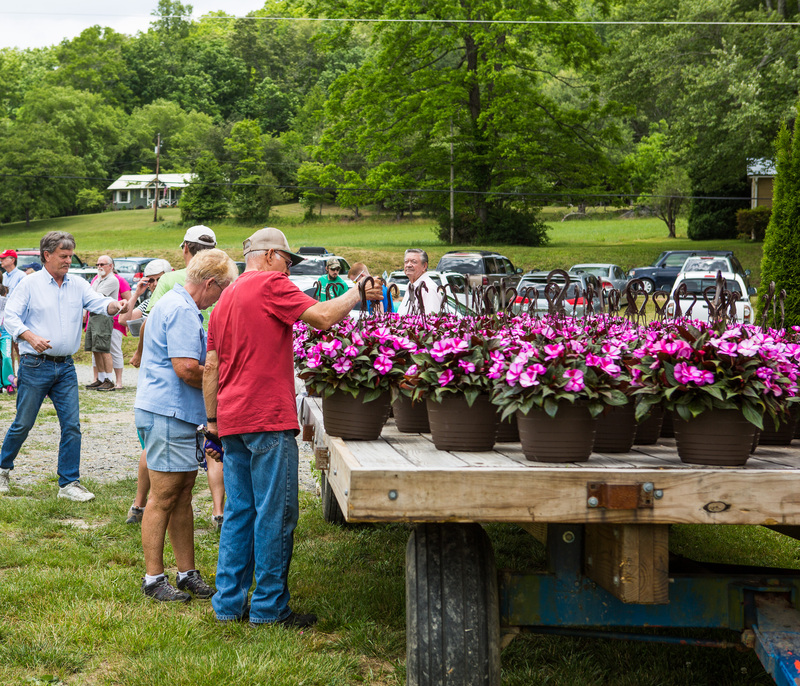 Admission is free, and the first 100 guests will even receive a free flowering hanging basket. 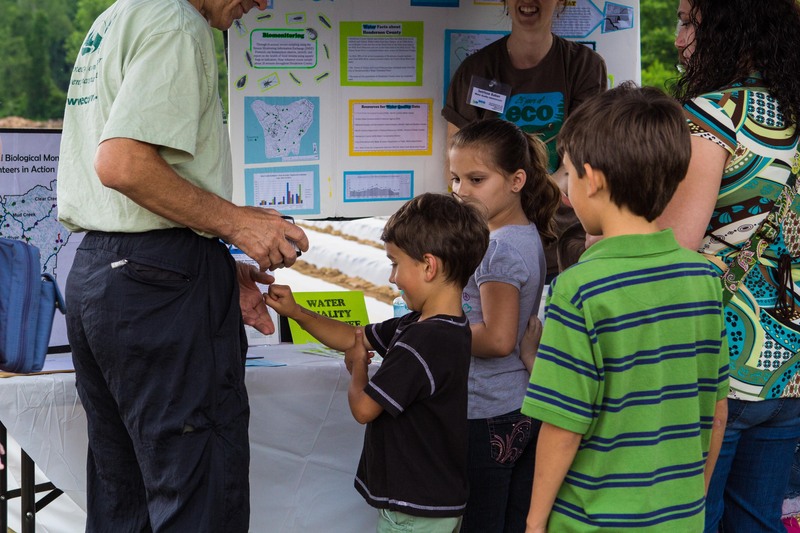 We had so much fun at Mills River Day last year, and we hope that even more of our community members come out to connect this year. 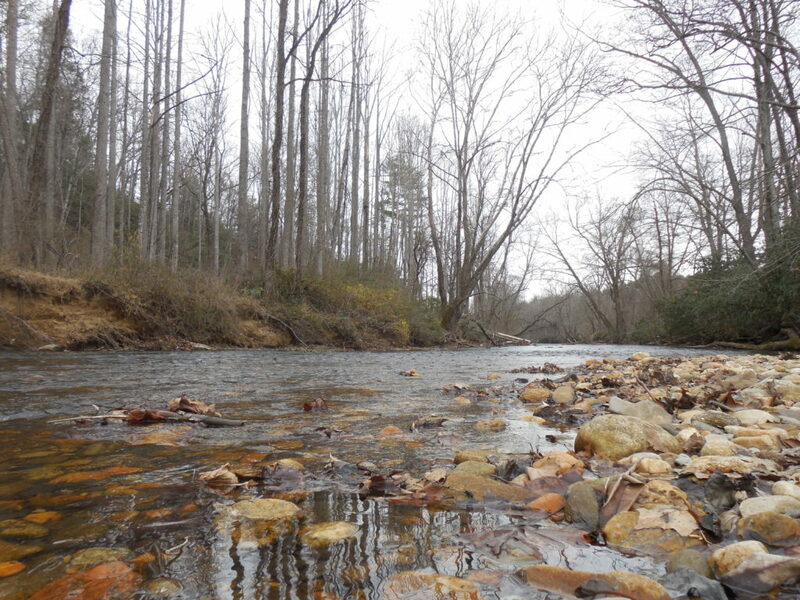 If you would like more information, check out this video from the Mills River Partnership. 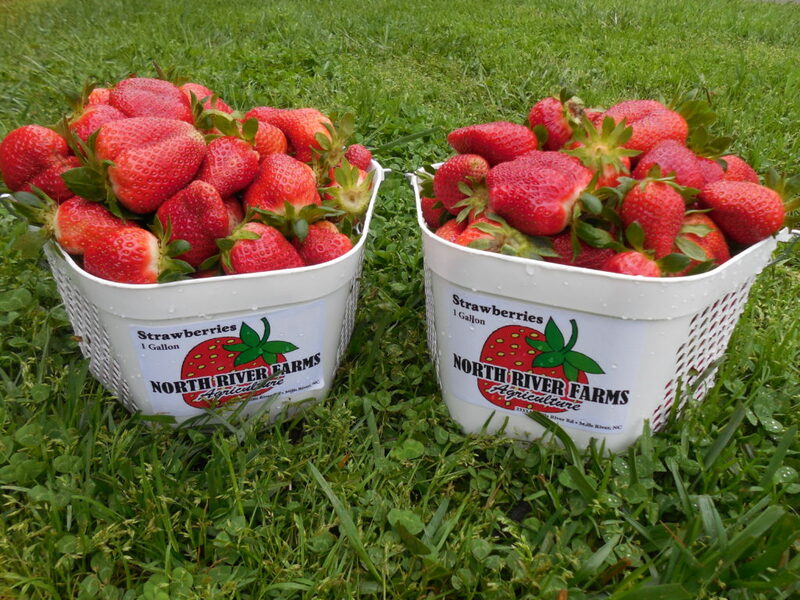 It has been a busy autumn at North River Farms. Our molasses facility is open, and we were thankful that Jason’s grandfather and grandmother were able to be with us as we made the first batch of molasses. They are the inspiration behind our expansion into molasses; we have the original equipment that they used in making their own molasses, and their experience and expertise has been invaluable as we’ve begun this venture. 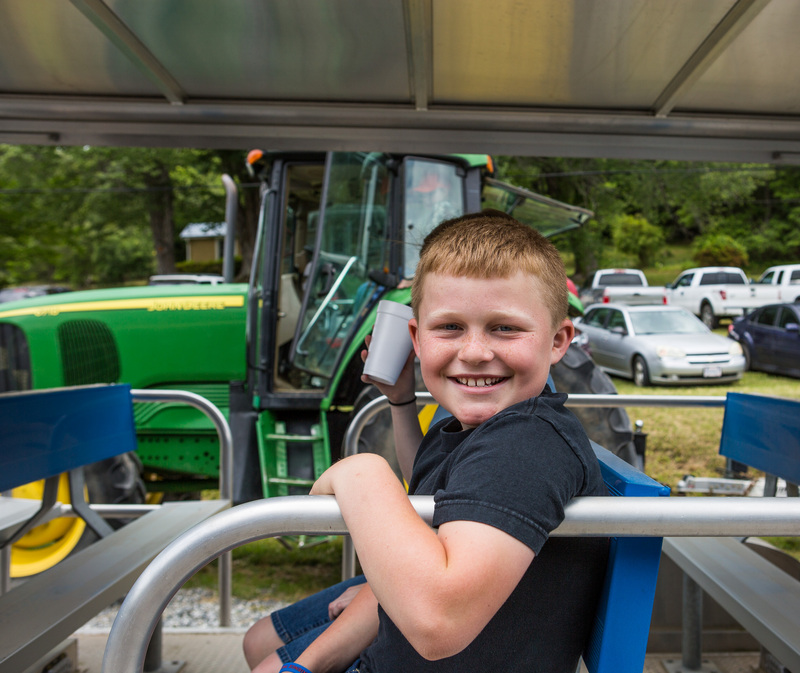 If you’d like to learn more about how we operate our equipment, check out this great article from the Blue Ridge Times. 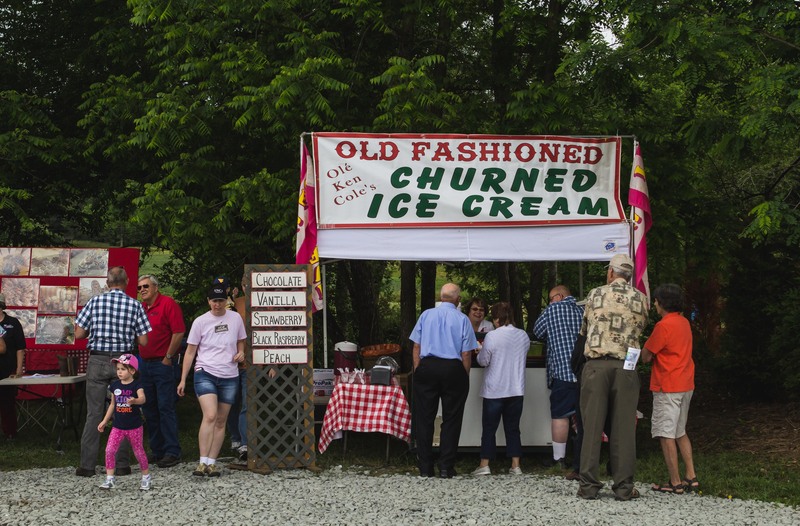 Many thanks to them for helping us spread the word about our old-timey molasses! 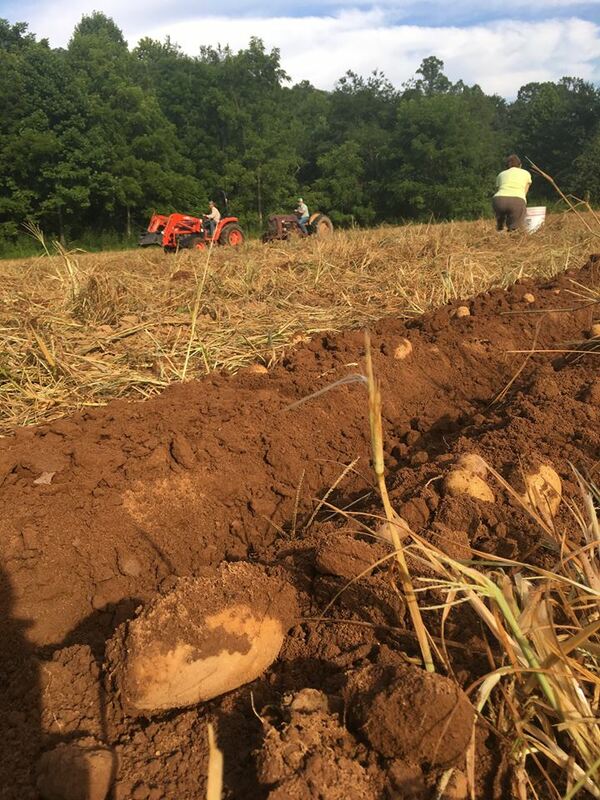 On August 18th, North River Farms was pleased to be able to donate a potato field to the Society of St. Andrew. 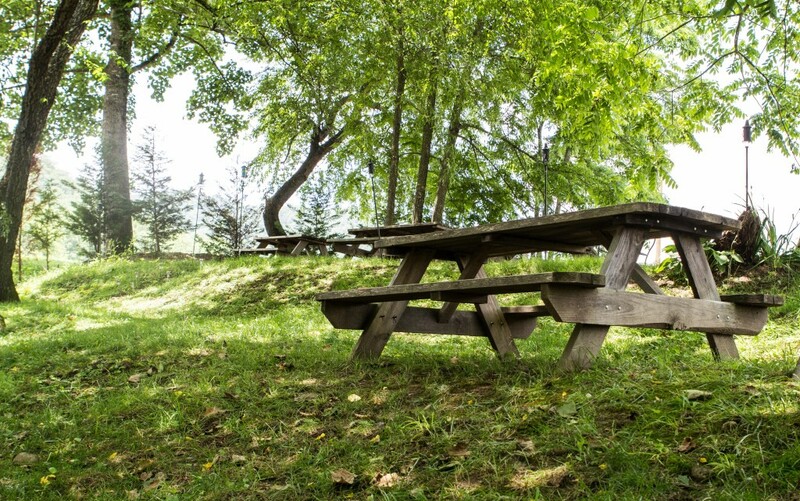 The Society of St. Andrew is an organization that gleans food straight from farmers’ fields in order to feed the hungry. 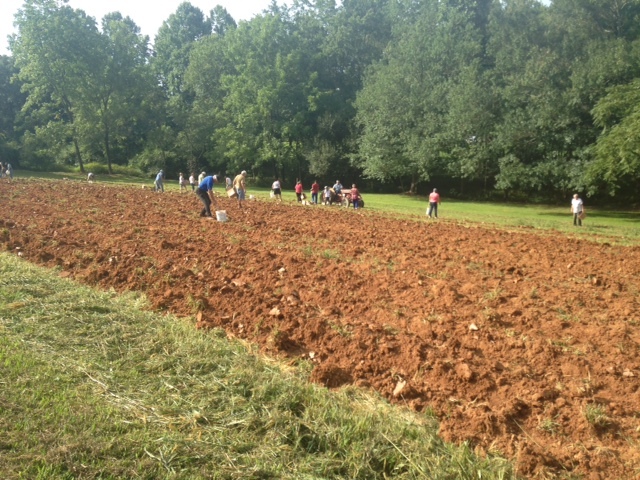 There were forty-two volunteers that came to glean the potatoes, and our crew helped, too. 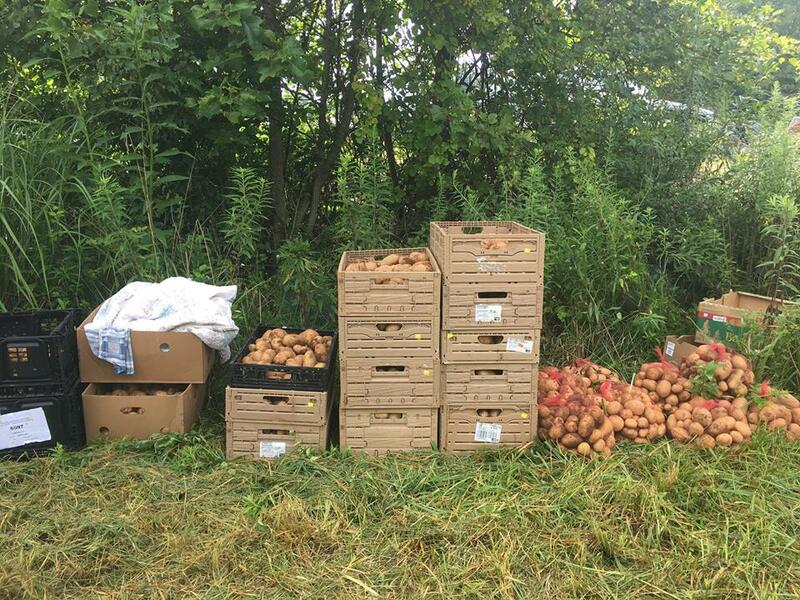 With all of that help, we were able to harvest and donate 5,238 pounds of potatoes! 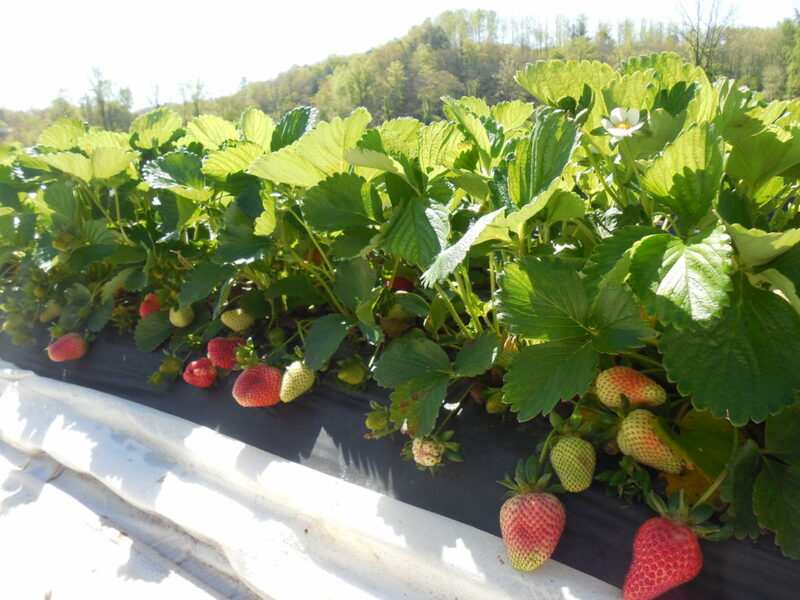 We’ve also been busy giving farm tours. 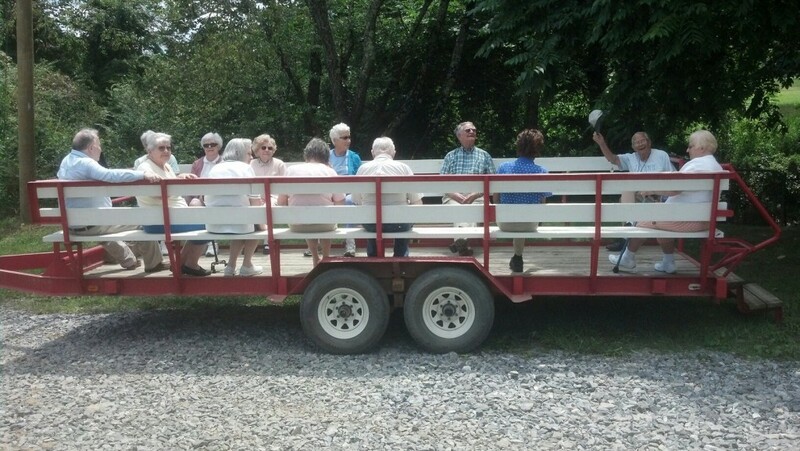 We hosted folks from the Emeritus at Pine Park living facility for a farm tour, picnic, and u-pick session. It was a wonderful day at the farm. Thanks for coming, Pine Park residents! 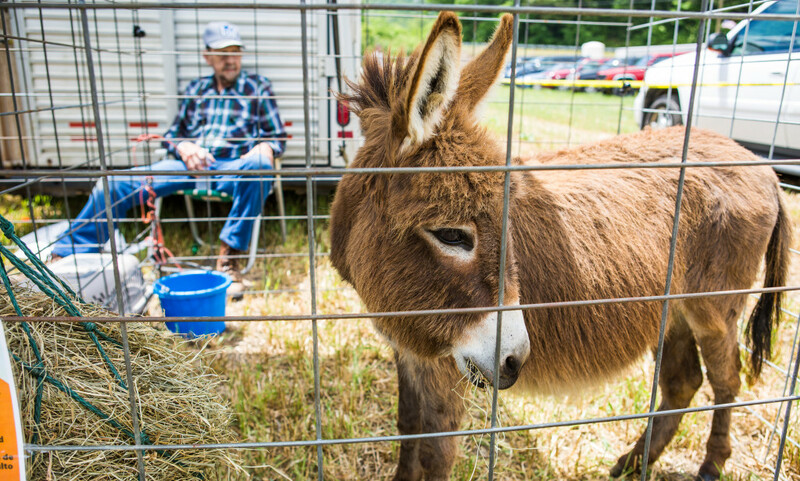 Coming soon to North River Farms: Molasses! 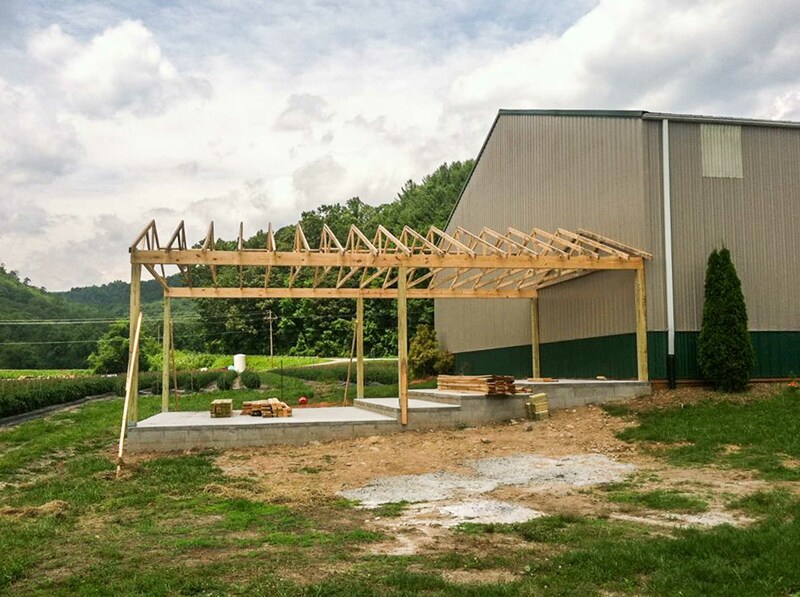 Since the beginning of June, North River Farms has been working hard to complete our new molasses mill and cooking facility. It isn’t quite ready yet, but we’ve made a lot of progress. 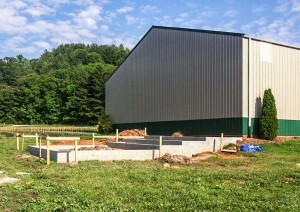 We expect it to be completed in October, and we couldn’t be more excited. 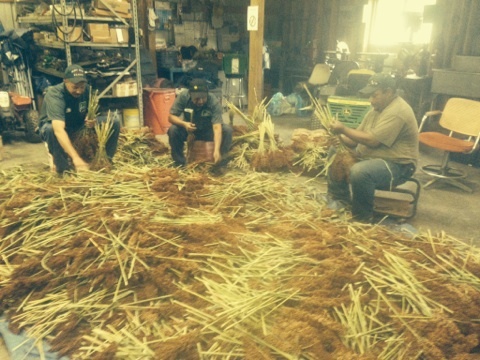 In the meantime, we’ve been busy growing a field full of sugar cane a few miles from the farm. 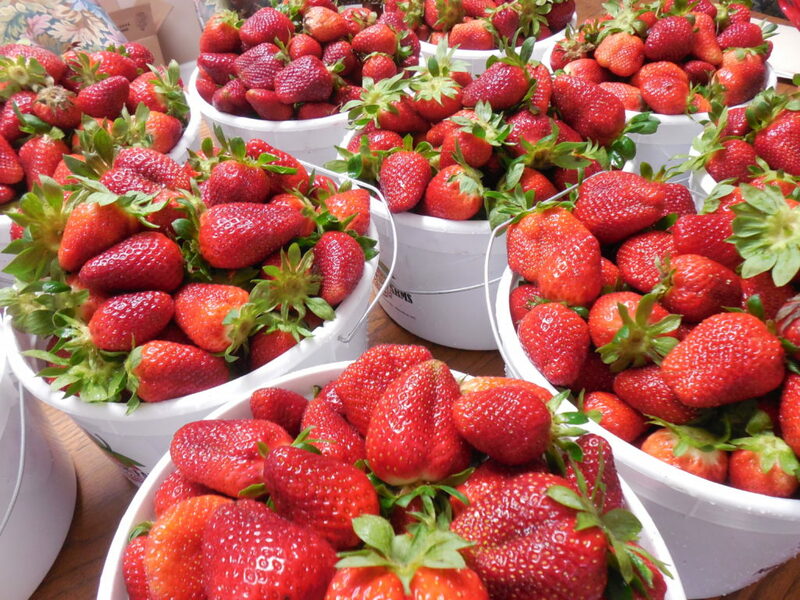 Harvest time should come toward the end of September. Once the facilities are completed and the sugar cane is harvested, the real fun will begin. 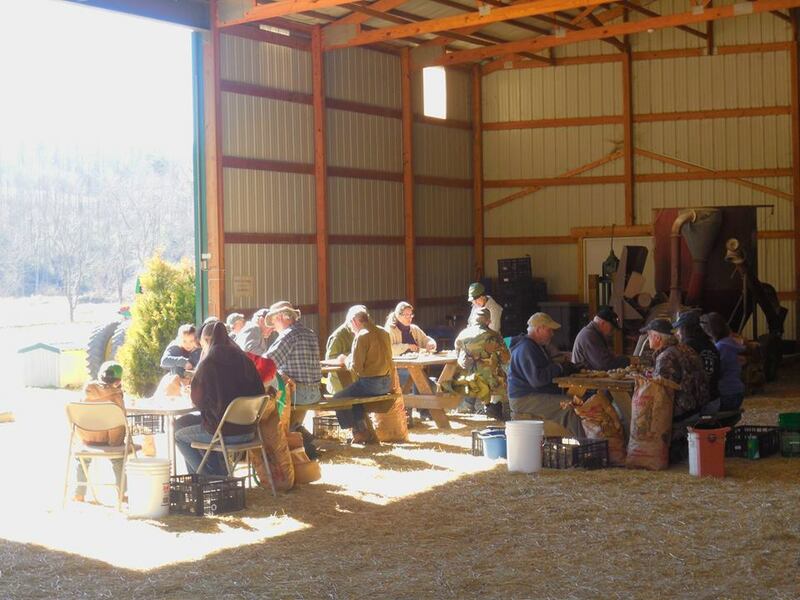 We will host live molasses-making demonstrations at our farm in Mills River. 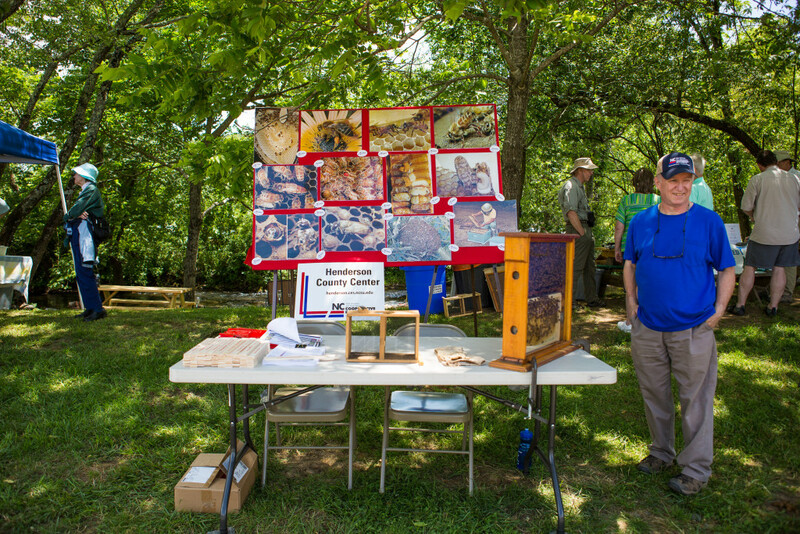 Making molasses is an all day affair, and we will welcome all visitors and observers! 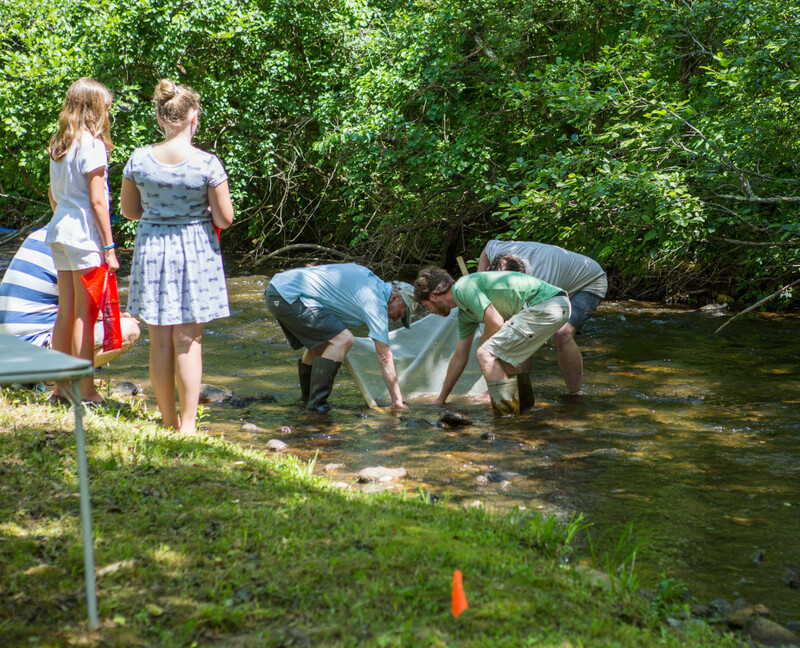 People have been making molasses in the North Carolina mountains for generations, and we are excited to invite people to take part in this educational process. 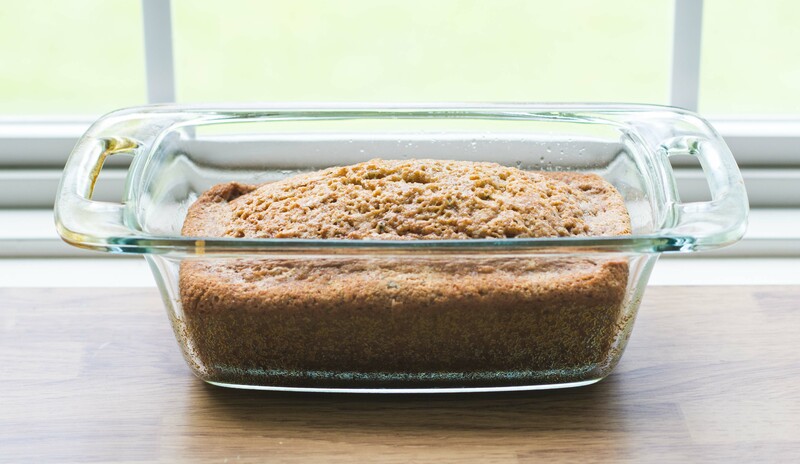 If you’re interested in attending any of our molasses-making demonstrations this fall, be sure to like our page on Facebook and stay tuned for updates! 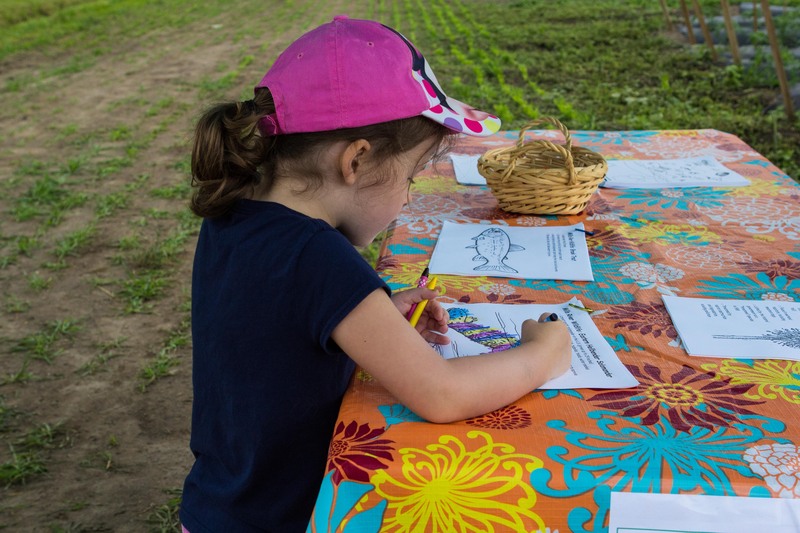 There’s just something about a farm that gets people interested. 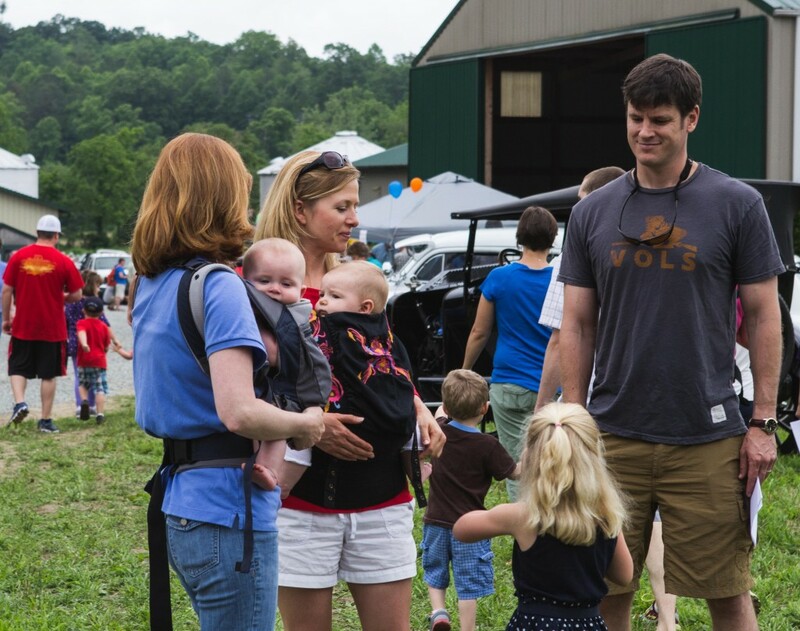 Children are fascinated by farms as soon they can push toy tractors across the floor. 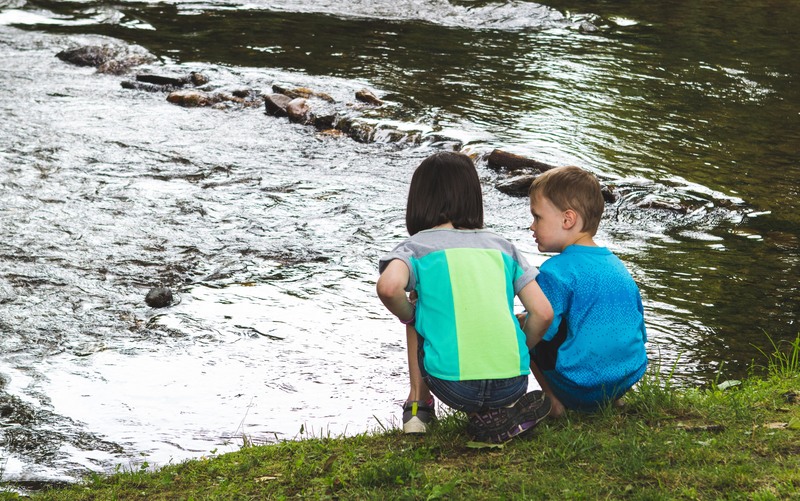 Some of the most beloved children’s songs are about farmers–Old MacDonald, The Farmer in the Dell, and B-I-N-G-O all teach kids from an early age that farms are important and fun to learn about. 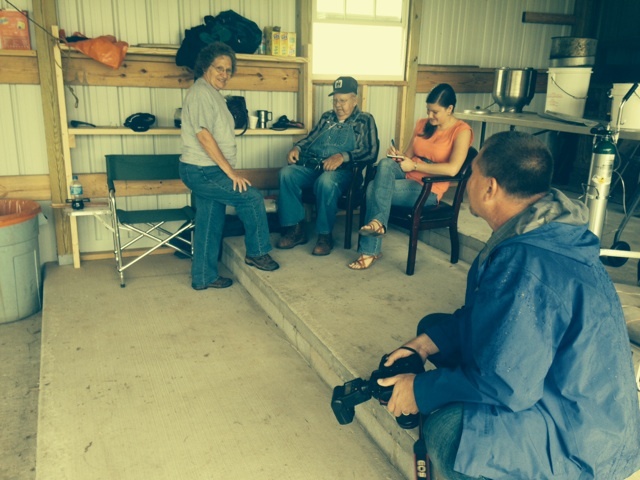 Perhaps what’s most interesting about farms is that we all, every one of us, depend on them. 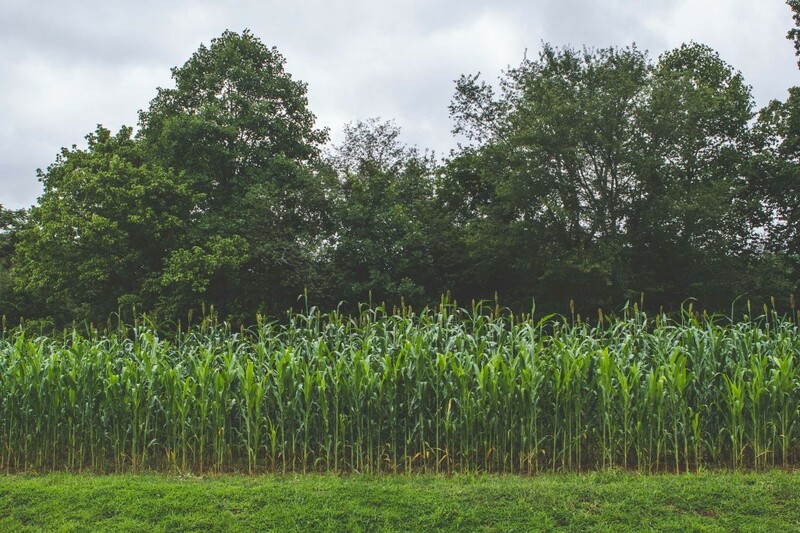 We might supplement with backyard gardens and homegrown veggies, but the truth of the matter is that we’d all go hungry without farmers growing the bulk of our food. Farms intrigue us because we know they are vital to our survival. 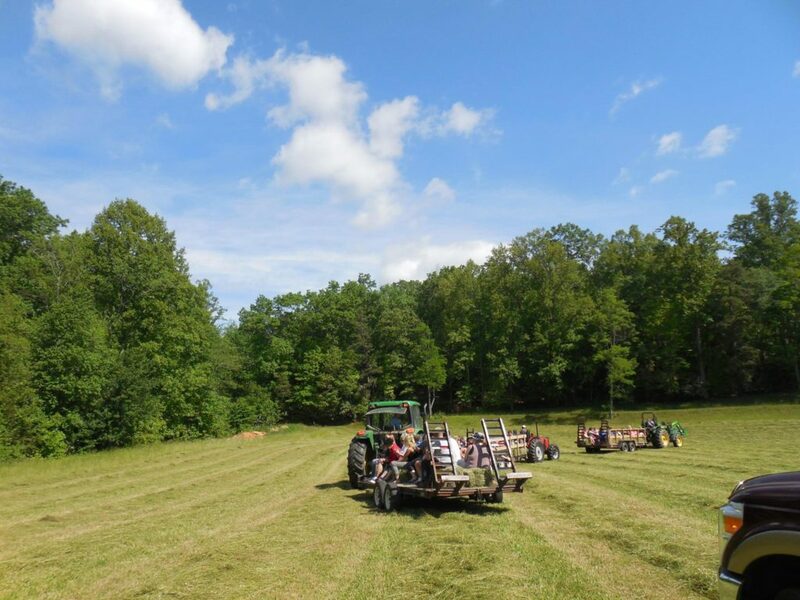 And while most of us would admit to having at least a passing interest in farming, few people are able to say that they truly understand what happens on an everyday basis at a working farm. 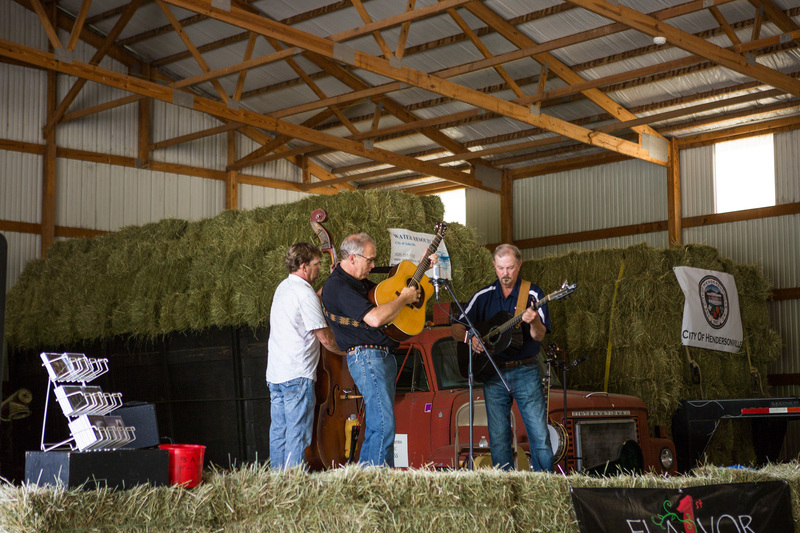 Sure, we enjoy the produce from farms and the scenery of a field just before the hay is cut, but most people don’t have all the knowledge they’d like to have about farming practices. 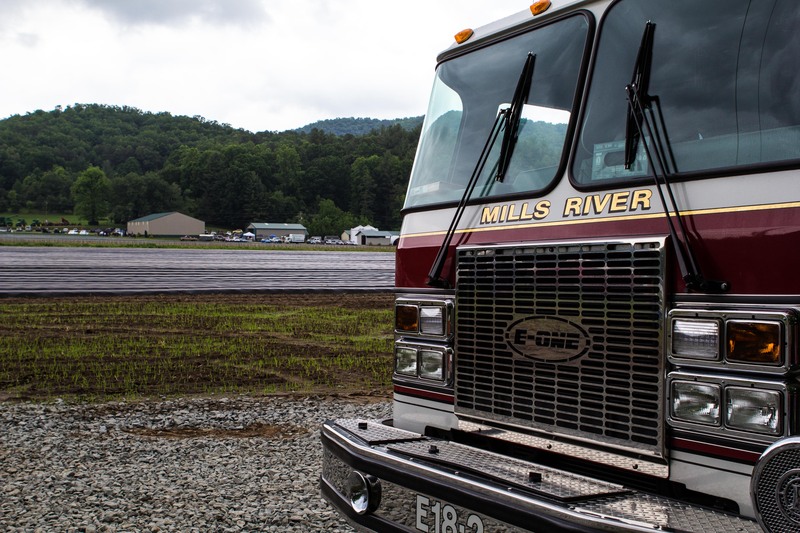 For those of you who are curious about farming, and would like to better understand what goes into a successful operation, North River Farms offers farm tours at our Mills River property. 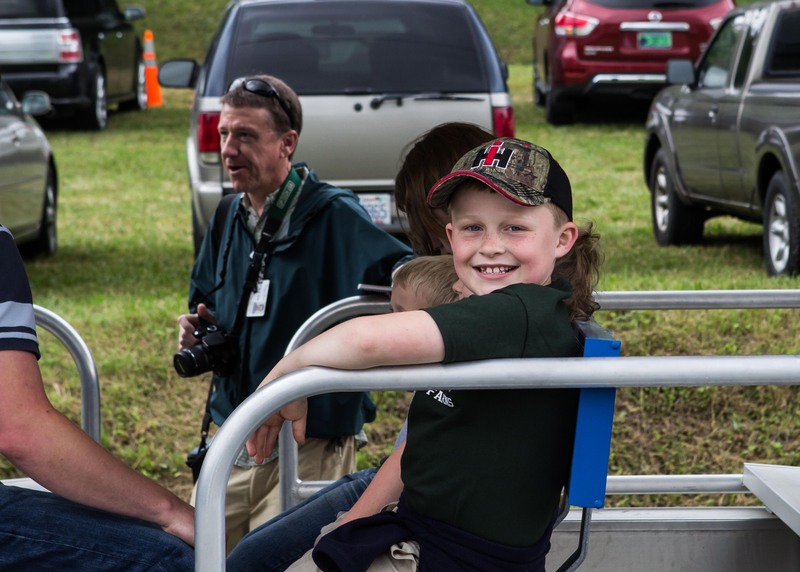 Consisting of an hour-long, informative, guided hay-ride, the farm tour is an authentic, entertaining way to educate yourself about farming. 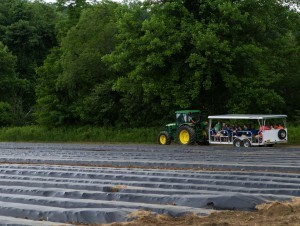 The farm tour is ideal for large groups. 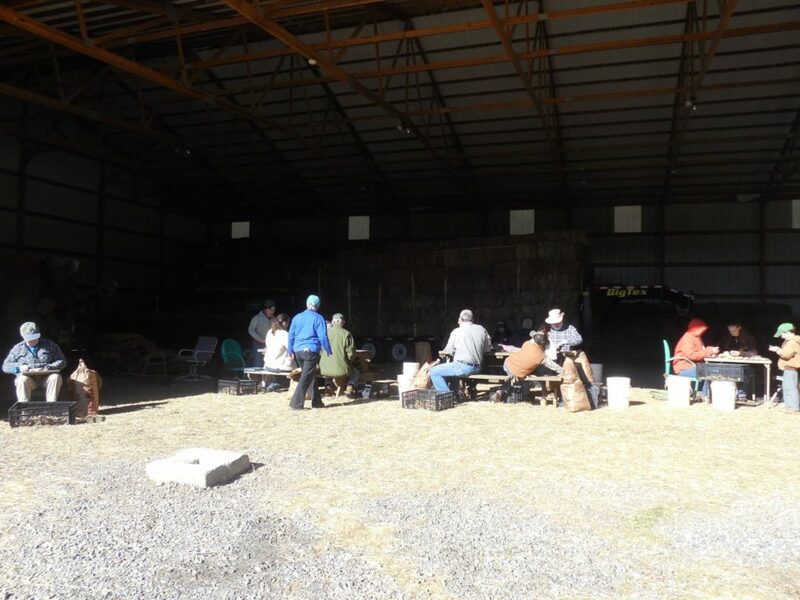 If you’re a member or leader of a club or social group, or just part of a group of friends who wants to learn about farming, contact us to make an appointment. We can’t promise that you’ll leave ready to start your own farm, but we can promise that you’ll leave with a lot more knowledge than you came in with. And the next time you overhear a conversation about farming, you’ll be able to join in with some insight from your authentic farm experience! What parts of farming do you find especially interesting? Let us know in the comments! 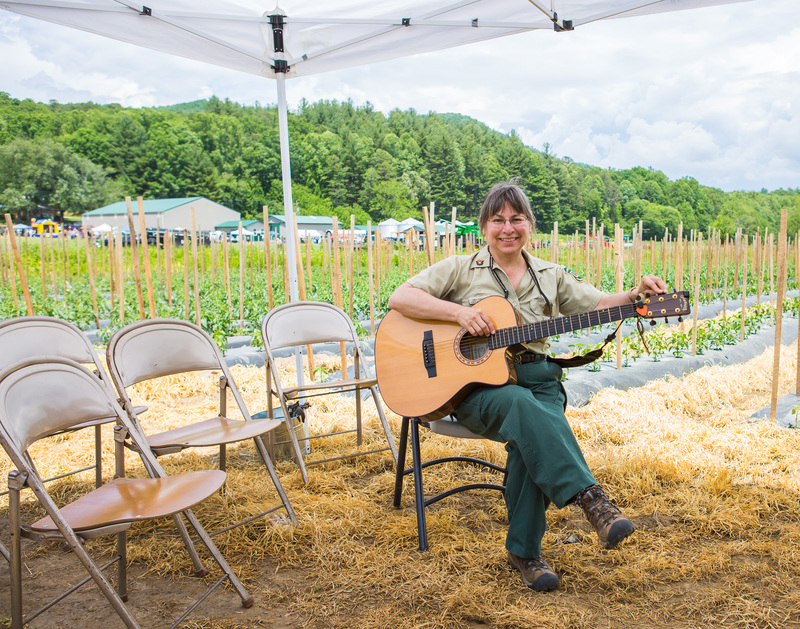 On Sunday, North River Farms was pleased to host the first Mills River Day. 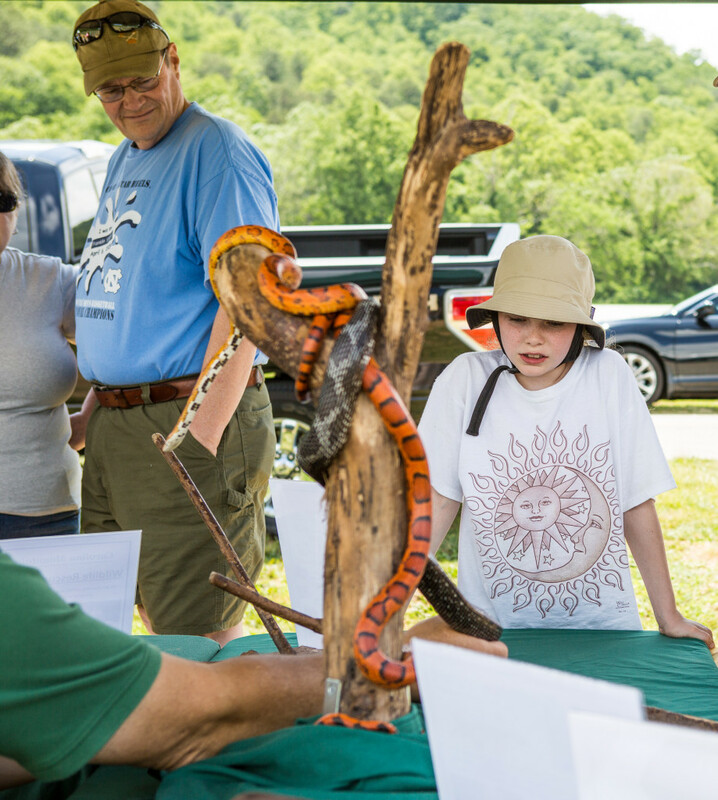 Sponsored by the Mills River Partnership, Mills River Day was a fun, educational afternoon. We had hundreds of guests who enjoyed ice cream, music by the Lonesome Road Band, educational booths, farm tours, and more. 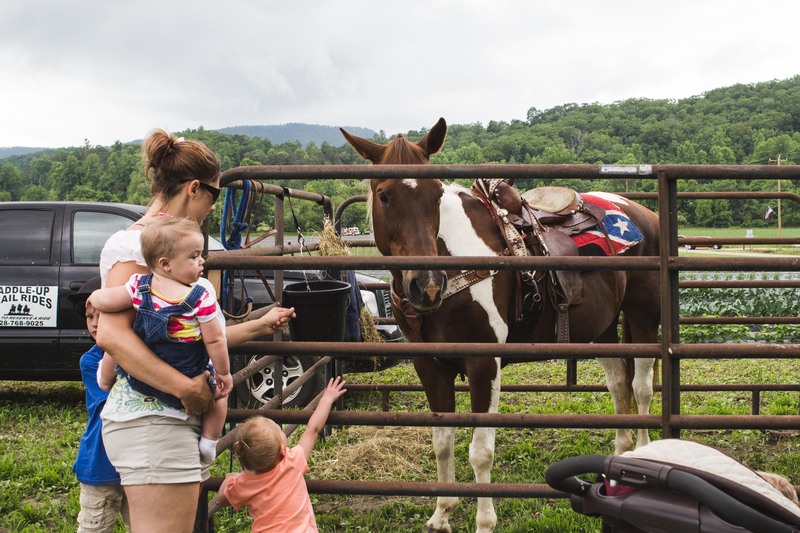 The weather was cloudy, but that didn’t stop Mills River residents from showing up to take part in the fun. 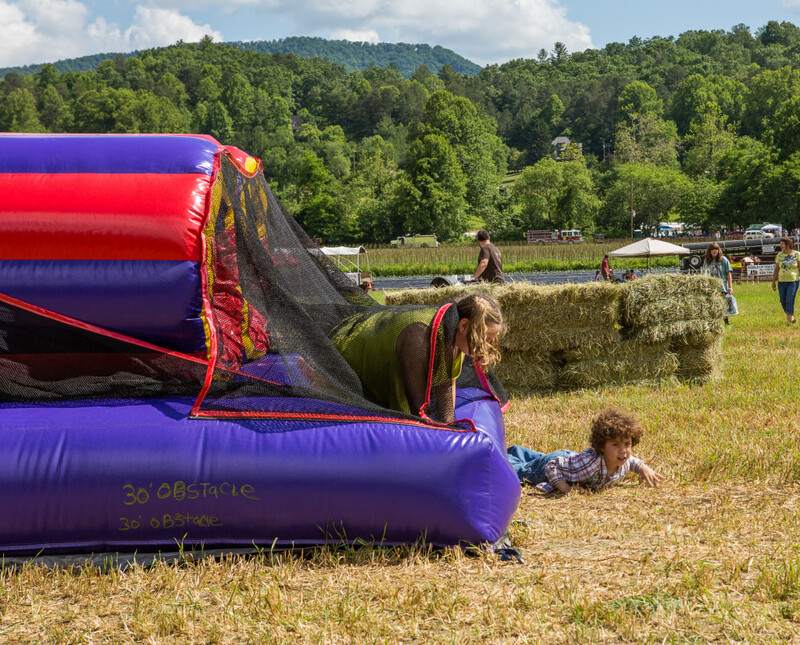 Children played in the bouncy house while adults checked out the antique cars, and everyone learned about the importance of protecting our watershed. We’d like to offer a sincere thanks to everyone who came out to Mills River Day. We couldn’t have done it without our sponsors, volunteers, and most importantly, our fantastic community members. We hope to see you again next year!